"Bernadette Donna LaPierre and Gretchen, Westbrook College, Class of 19"
Westbrook College student Bernadette Donna LaPierre, Class of 1977, was a Nursing major and a Day Hop. 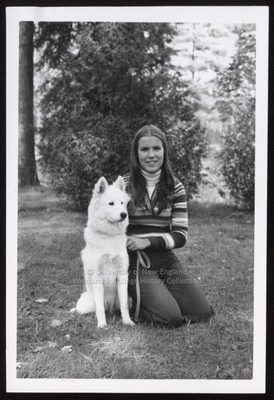 For her senior class candid photo, which appeared in the 1977 Tower Yearbook, she wore slacks with a white turtle neck jersey and colorful striped sweater. Her hair was long, parted in the middle and hung well over each shoulder. Bernadette kneels on the grass with her dog Gretchen beside her.